The SP speaker cables use high quality solid core military specification wire. The cosntruction is silver-plated copper insulated with virgin white PTFE (teflon) insulation. Microporous PTFE (foamed teflon) provides additional insulation between twisted pairs creating an air dialectric that results in better definition of vocals and instruments. Excellent detail across a broad frequency range with great transparency up to 27 kHz and a solid well-defined bass response. 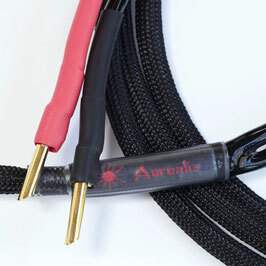 State of the art speaker cables at an affordable price. Don't buy more metal than you need to. Choose the gauge to suit your system. Two pairs of of PTFE insulated 20 awg solid core silver-plated copper per channel. Ideal system match: amplifiers up to 75 watts per channel with 8 Ohm speakers. Four pairs of of PTFE insulated 20 awg solid core silver-plated copper per channel. Ideal system match: All systems running amplifiers up to 150 watts output, especially with 4 Ohm speakers. Those with very high powered amplifiers may wish to consider SP620e or UP620e for squeezing the ultimate bass power out of their systems. Six pairs of of PTFE insulated 20 awg solid core silver-plated copper per channel. Ideal system match: Amplifiers up to 300 watts per channel. Will deliver enough current to the speakers to power even the laziest of woofers. Aurealis Audio specialises in handcrafted interconnects and speaker cables using the highest quality wire and connectors.